2019 – present – member of the Bead&Button/Facet Editorial Advisory Board. 2014 – Jasmine Pearls project – Beadwork Presents: Favorite Bead Stitches 2014 Collector’s Edition. 2013 – Crystal Drop project – Beadwork Presents: Favorite Bead Stitches Ultimate Collection -patterns from the last 5 years. Sway, Swing, and Slide – published by Lark Jewelry & Beading Bead Inspirations. – an Imprint of Sterling Publishing Co., Inc. Gallery section. 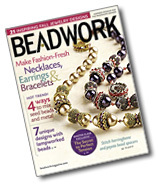 Beadwork Magazine – Aug/Sept 2009 issue.